SunRocket has eclipsed 200,000 residential subscribers -- a testament to the rising strength of the category and the firm's determination to redefine what is possible when it comes to enhancing home-centric communications. The company has also launched or expanded service in several key markets over the past few weeks, bringing SunRocket's unique and compelling value proposition to the doorstep of millions of U.S. broadband households. "Building a 200,000 subscriber base from scratch in a relatively short period of time demonstrates how rapidly consumers are embracing the value, simplicity and enhanced feature set of SunRocket Internet phone service," said Lisa Hook, president and CEO of SunRocket. "And while category growth has been impressive -- approximately 10 million U.S. consumers subscribe to VoIP -- we have barely scraped the surface in a market with more than 50 million broadband households ready, willing and able to make the switch to SunRocket." SunRocket and American Telecom Services launch a fully certified DECT 6.0 cordless multi-handset Internet phone powered by SunRocket. The E6501S DECT phone will be available through nationwide retail channels beginning this month, starting with one of the nation's largest office superstores. With an integrated router, users no longer require a separate Internet phone adapter, as full VoIP capabilities are already built in. In addition, because the DECT 6.0 phone operates in the 1.9 GHz frequency band, defined by the FCC specifically for cordless phones, the DECT phone avoids interference problems associated with home networks and other wireless devices operating in the 2.4 GHz and 5.8 GHz frequencies -- such as Wi-Fi, microwave ovens and garage door openers. DigiLinea and SunRocket will utilize the DigiLinea Latin American VoIP Network to provide high quality, low cost direct call termination to locations throughout Latin America. By working with DigiLinea, leading service providers have access to the DigiLinea Latin American VoIP Network, providing a turnkey suite for addressing the needs of the US Hispanic market. Once interconnected with the DigiLinea Latin American VoIP Network, service providers can quickly and efficiently launch customized VoIP offerings, and at the same time, dramatically lower termination costs on calls to Latin America while increasing service provider revenue and profits per line. SunRocket announces an unprecedented new calling plan that drops rates to Asia Pacific locations including China, Japan, Hong Kong and Vietnam to as little as one cent per minute. The annual, all-inclusive $199 Asia Pacific Edition offers a compelling and unique alternative for U.S. consumers who frequently call friends and family located throughout the Asia Pacific. With per-minute calling rates well below traditional phone service offerings and as much as 90 percent less than other major VoIP providers, the SunRocket Asia Pacific Edition value proposition is unmatched in the industry. "Prior to the SunRocket Asia Pacific Edition, consumers were forced to jump through hoops to seek savings on international calls to these destinations, often resorting to inconvenient and deceptively expensive prepaid calling cards," said Joyce Dorris, SunRocket co-founder and Chief Marketing Officer. "Now SunRocket makes it easy for consumers to enjoy the lowest per-minute rates to Asia, building upon our mission to change what is possible for consumers and challenge historical pricing practices by our competitors." The Asia Pacific Edition reduces international rates to $.01 per minute on all calls (landline and cell) to China, Singapore and Hong Kong; and on landline calls to Taiwan, Malaysia and South Korea. Landline rates fall to $.02 per minute for Japan; while SunRocket's rate on all calls to Vietnam is cut nearly in half to $.10 per minute. SunRocket, announced that Thomson, Inc., will enter into an agreement to explore various promotional activities to expand the presence of SunRocket's VoIP services. The agreement also includes the development of future GE branded products that will leverage various feature capabilities available through SunRocket Internet phone service. Today only Sunrocket is offering 2 years of VOIP phone service with free activation and free equipment. 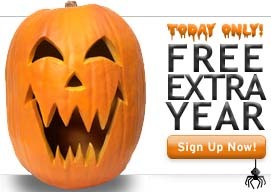 Click on "Free Extra Year" Halloween banner. Unlimited calling to the U.S., Canada, and Puerto Rico. Free Built-In Features - Caller ID, Call WAiting, 3-Way Calling and Much More!